Every review of a game featuring a haunted house deserves that kind of intro, and yes there’s plenty of house to get you and your guests haunted in within Golden Ruby Games‘ latest indie entry. It’s a straight-to-the-hunt faux retro concept with a seamlessly pleasing gimmick. You’ve got the D-pad to move, one button to jump and only one other mapped for attack regardless of how many specter slaying pickups you zip into. Yes indeed, Extreme Exorcism adopts an all cylinders ablazin’ or nothing approach which bids for an increasingly tumultuous strain of play. As for the gimmick? You are a ghostbuster haunted by the apparitions of your past controller inputs. Let’s say you moved left then double jumped, swung a sword, unleashed a harpoon and launched a rocket all in unison? During the next round there will be a pixelated phantom performing this very act with which you will have to avoid and ultimately put out of its misery to progress. Round after round you and your ‘replays’ continue to cloud the arena hereby ramping the difficulty for unscathed survival. Exorcise twenty minutes a day. 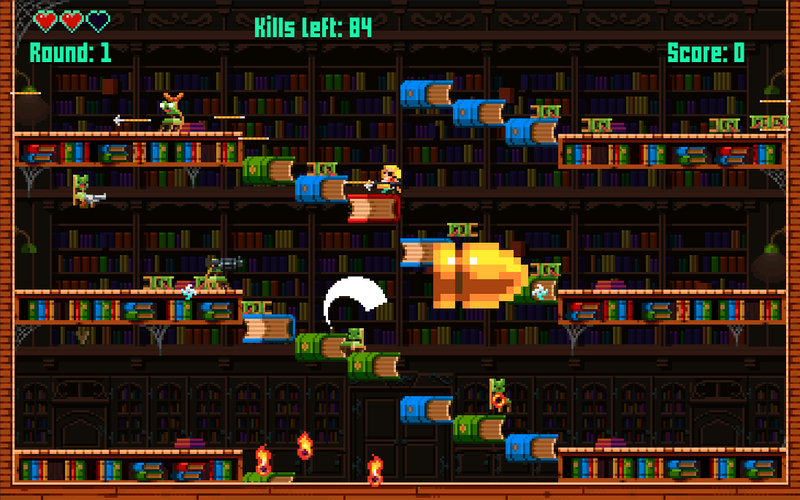 The thrust of the title is this cause and effect gameplay featured in the Arcade mode. You or a team of up to three extra real life chums have the run of an eerie mansion with all the textbook staples to exorcise in, such as a graveyard, foyer, cellar, library and conservatory etc. each with their own thematic hazards and sub-levels. Otherwise there’s the less friendlier multiplayer only but fully tinkerable Deathmatch mode or five tiers of Challenges for those who prefer to go at it soul-o *wink, wink, nudge, nudge*. As soon as I booted up this game with my partner in tow or with a banter ridden frontroom the game went from being humdrum to a good dose o’ fun. The screen inevitably filling up with flailing sprites as we all scrambled for the crown wearing round ending spirit. Or attempting to slay each other with weapons which attack in strict horizontal paths whilst bouncing off poltergeist beds! Gruff bellows and ghoulish reverb aside I believe Extreme Exorcism to be the Wii U’s current surrogate for the infectious one screen arena mania treat that is TowerFall. What Golden Ruby Games brings to the pixel art battle royale platformer formula is an alive vs. dead self inflicted difficulty spike. It’s no doubt quick fire play begging for two players or more, yet again forging another compelling “indie developers really are ruling the roost right now for couch co-op experiences” argument. The true fright delight of this game stems on surrounding yourself with an abundance of salty bites, refreshing beverages and local like-minded individuals. With the lasting success waging on how much you relish slaying these said individuals digitally or chasing team/personal bests. Halloween is almost upon us folks, and if you’re at a loss for some appropriately decent Wii U entertainment for that party you were meant to be hosting. This could be the pre or perhaps even post homemade witches’ brew saviour you were after. Either way promise me one thing, if you ever do get around to witnessing the title screen please, please, please bellow… “EX-TREEEME EXOR-CISM!” like you mean it! 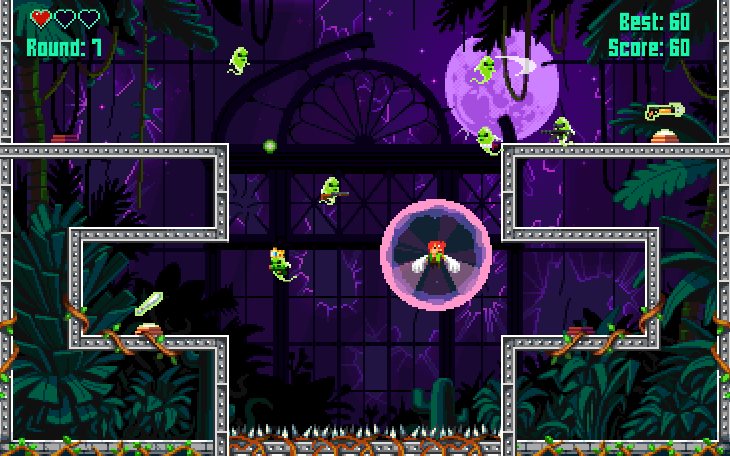 Extreme Exorcism is out now! This Nintendo Scene Review wouldn’t have been possible without a press copy kindly provided courtesy of Ripstone Ltd.